This was a very funny and witty book about the life of a supermodel’s daughter. Lizzie Summers is the only daughter of supermodel Katia Summers. Everywhere she goes, she is known as Katia’s daughter and she is sick of that. Lizzie is the exact opposite of her mom- her mother is beautiful, Lizzie is not, her mother loves the spotlight, Lizzie does not. Whatever her mothers likes, Lizzie doesn’t. Lizzie’s best friends are Carina Jurgensen and Hudson Jones. Carina’s father is a multi-millionaire and Hudson’s mother is a famous singer so they both know how Lizzie feels. Lizzie is an outcast in her own family, but when a photographer approaches her and tells Lizzie she wants her picture, Lizzie surprises herself by saying yes. She further surprises herself by liking it. There’s only one thing- Lizzie hasn’t told her mother yet because she doesn’t think her mother will approve. Lizzie has Carina forge the signature on the consent form for the photo shoot, but Lizzie doesn’t know how long she can keep it a secret. Will her mother find out? 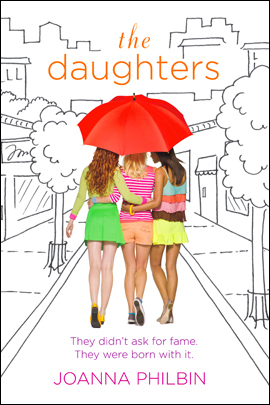 Keep an eye out for the 2nd book in this series, called The Daughters Break the Rules!